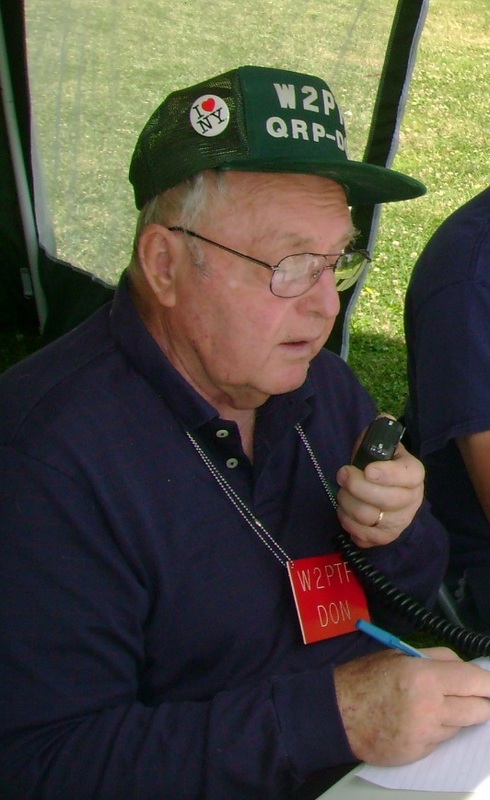 Don Stein was a member of QSY since 1998. He was instrumental in obtaining our Field Day site at Carnwarth Farms 2003-2005, and enjoyed yearly visits to Field Day, and meetings. He will be missed. WAPPINGERS FALLS – Donald Francis Stein, 85, of Wappingers Falls since 1968 and formerly of Adams, MA died on Saturday, January 26, 2013. Born on July 14, 1927 in Rochester, he was the son of Francis H. and Cecilia Kircher Stein. After high school, he was a disc jockey and worked for Philco from 1951-1954 in Korea, Japan, Germany and France supporting radio and radar stations. He received his Bachelor’s Degree from Iona College and was employed as a test engineer for Perkin-Elmer in Danbury, CT for 20 years until his retirement. He had worked on the Hubble Space Telescope and was a Ham Radio Operator. Donald was a parishioner of St. Columba Church in Hopewell Junction. On August 6, 1955 at St. John’s Church in the Bronx, Donald married Mary W. Glennon who predeceased him on October 28, 2009. He is survived by his sons and their wives, William and Marguerite Stein of East Fishkill and Joseph and Susan Stein of Yorktown; his granddaughters, Margaret, Rachel and Joan Stein of East Fishkill; and his brothers, Francis and George Stein. Calling hours will be held Thursday from 2-4 and 7-9pm. The Mass of Christian Burial will be celebrated on Friday at 11:30am at St. Columba Church, 835 Route 82, Hopewell Junction followed by interment in St. Denis Cemetery. Memorial donations may be made to the Alzheimer’s Association , 2 Jefferson Plaza, Suite 103, Poughkeepsie, NY 12601. This entry was posted in Blog Post, silent keys. Bookmark the permalink.